Find rest for your soul and inspiration for your daily walk with God. Throughout the year, Cedar Springs hosts a variety of camps and retreats for adults. We facilitate opportunities to get away from the stresses of everyday life and connect with God and others through in-depth study of the Word (featuring incredible speakers from around the country!) and quality fellowship time in our beautiful facilities and 117 acres of wooded forest. Check out our list of camps and retreats below, and join us for an event to refresh your spirit and rejuvenate your soul. A weekend in the woods designed especially for men. Along with recreational activities that men enjoy, this camp includes opportunities for men to connect with other men as well as connect with God. Our theme: This Is Us, focusing on our identity in Christ. In our sessions, we will watch a series from Tony Evans. And what would any camp be without "BACON". Well we will have it with every meal, how's that for incentive to attend. Options for Friday and Saturday event or Friday through Sunday, find a time that works for you. Tea for the Soul is an experience for women of all ages, to spend the day exploring opportunities to serve in their local communities. 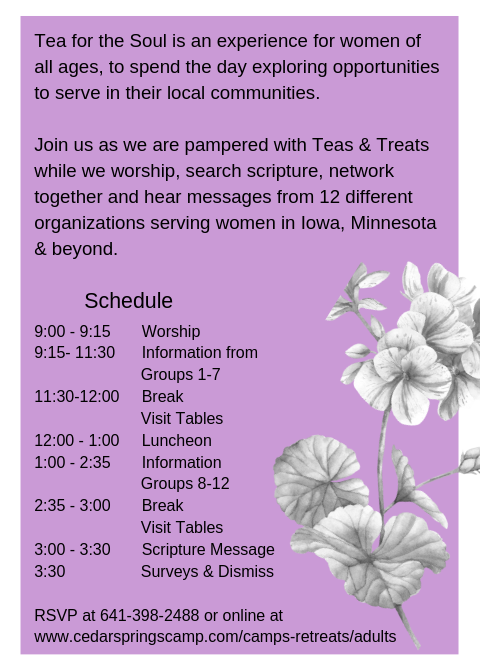 Join us as we are pampered with Teas & Treats while we worship, search scripture, network together and hear messages from 12 different organizations serving women in Iowa, Minnesota & beyond. Family Retreat is an opportunity for you to get away from the busyness of life, worship God, connect with other believers, and reconnect as a family. This year's theme is "This Is Us" reflecting on 1 Peter 2:9-10. Our special event this year at Family Retreat will be a Family Fair Friday afternoon starting at 1:00 pm! It will include Bounce Houses, Carnival Food, Pony Rides, Barrel Train Rides, Face Painting, Wagon Rides, and much more! Get the dates on your calendar and register today! Fees vary on which lodging you choose and whether or not you eat meals at the dining hall. The activity fee includes all snacks, coffee, games, canoeing, tubing, water slide and fair activities. Fee is $5.00 per day per person with a $15.00 per day maximum per family. The Women’s Retreat is an overnight gathering designed especially for women and young ladies 16 yrs and older. Along with activities that women enjoy, this event includes opportunities to connect with other women as well as connecting with God. The retreat cost is $50.00. This includes 3 speaker sessions; 3 breakout sessions; 3 worship sessions; 3 meals; lodging, and various activities. We welcome Cindy Cole Nelson and Kathe Matthews of Road to Joy Ministries as our guest speakers.